Growing up, I longed for the evenings when my father arrived home from work and was not yet ready to retire from the outdoors. These special evenings meant that we would soon be gathering around an old tractor tire rim in the backyard. My father would fill it with wood and create a fire, while my mother would gather the fixings for s'mores. Us kids would gather benches and camping chairs, excited for the postponement of our bedtime. Often, we would spend the next hour or two huddled around that tire rim, chatting about nothing of importance, and making tasty s'mores. My favorite of these nights were the nights that we would just sit in silence, no one sensing the need for words. We were nestled deep in our little valley of the Driftless Area and life seemed to stand still. The sun would slowly sink below the Ocooch Mountains and we would watch in wonder as the stars began to shine. I was always in awe of how spectacular that blanket of stars twinkling above me shined. To this day, these nights are some of my favorite childhood memories. We try to relive them when all of us kids are home, but the mystery is no longer there. There is always something to talk about and we are always checking our phones. Even the s'mores have been replaced by plain old marshmallows and beer. But even with all these changes, these nights still represented the most important thing my parents ever taught me: that we are to seek out and cherish... our time with family. I think this is a marvelous example of what a "Sentimental Sunday" post can hope to accomplish. I felt both the delight of your childhood perspective and the poignance of the struggle to recapture it. You motivated me to look up where the Ocooch Mountains and the "Driftless Area" were, too. Ah, this is nice Sara. Thanks for sharing. It sounds like a wonderful memory. I too feel the need to look up the Driftless Area and the Ocooch Mountains, LOL. I agree with Dean, perfect example of a "Semtimental Sunday" post. We get so caught up in the "stuff" of our daily lives that we forget to look up and enjoy the stars! Thanks so much Sara for bringing this to mind. Wonderful post. 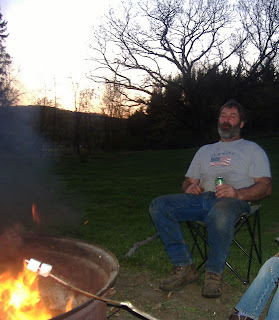 Wonderful post, Sara, I could almost smell the fire and taste the s'mores. You're a gifted writer. As the creator of "Sentimental Sunday", I must concur with the comments of others. This was one of the goals of the theme - to encourage bloggers to write about special memories of family members or family events. This is a beautiful, and quite sentimental post. You are luckly to have a family that enjoys spending time together. (I could tell that already from your tweets, anyway.) Now, I want some s'mores!! !